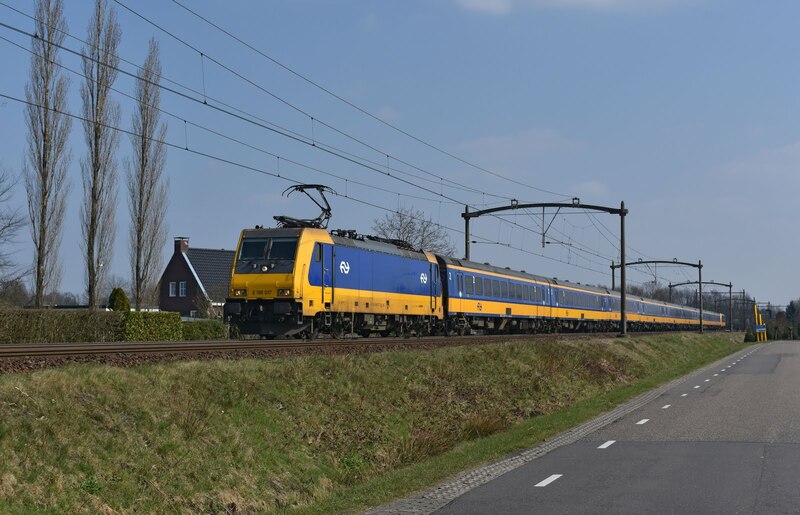 1740 approaches Nijkerk with a push pull DD-AR service from Zwolle to Utrecht. 24 March 2018. Arrival in the Netherlands was by way of Hook of Holland and the overnight sailing from Harwich on board the Stena Hollandica. We had got a decent sleep and woke up to the call for breakfast as Holland appeared at the window. Disembarkation was around 08:30, past the site of the former Hoek van Holland Haven station which since my previous visit has closed for conversion into a metro line. There is some evidence that the line has seen some work since the NS route closed in 2017, however the proposed opening, originally scheduled for early 2018 seems to have slipped considerably. I struggled to work out what ticket I needed for the bus connection to Schidam Central but fortunately the bus driver was able to assist and advised that our ferry tickets would cover us on the bus- good start. It wasn't too long before we were back on a train, and despite some reports I had heard the bus was fairly prompt and had plenty of room for all of the foot passengers off the boat. 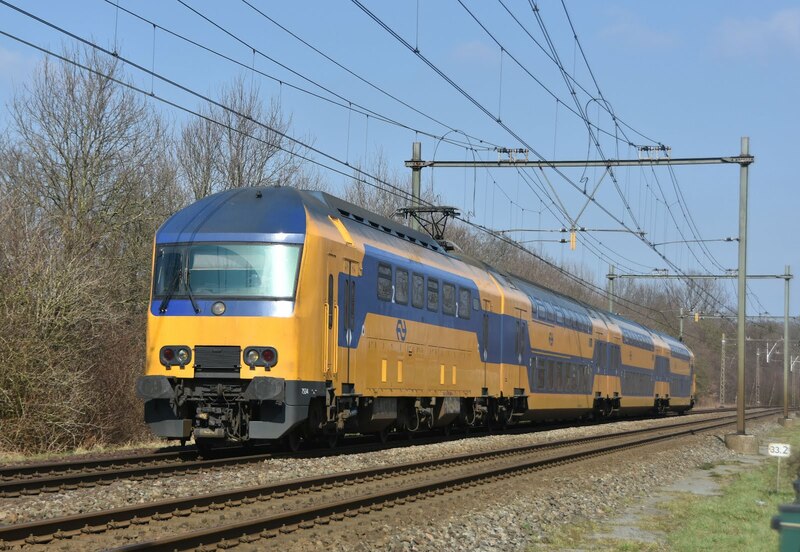 Our first train to Rotterdam was VIRM double decker unit. 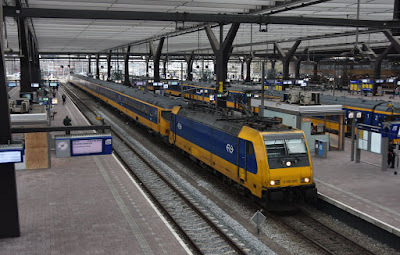 There was soon plenty of loco-hauled activity at Rorterdam Centraal and we enjoyed spending some time photographing them in the gloom that we had woken up to. 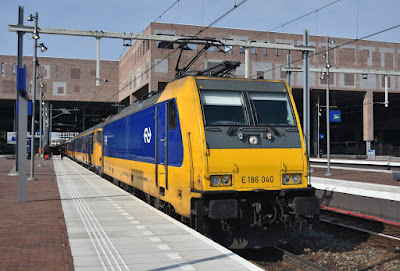 We missed the first Inter City Direct train that we had thought about getting so instead ended up on a Breda service with a Bombadier 186. 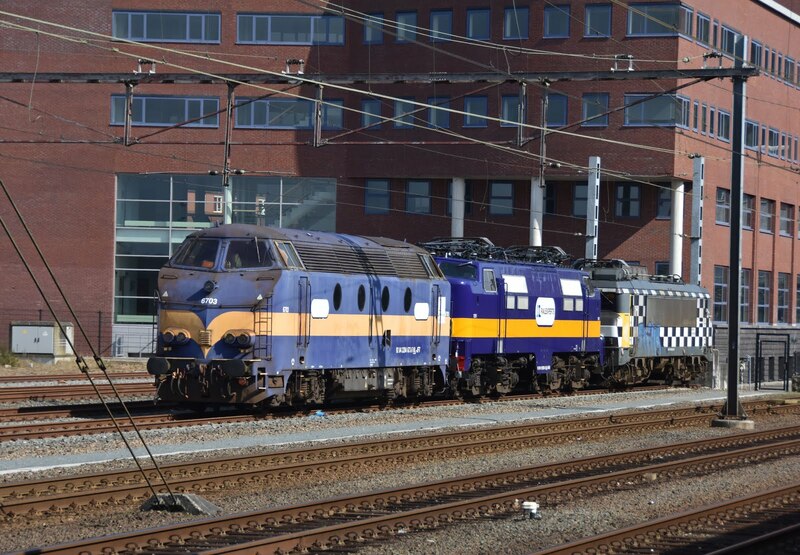 There are two types of locomotive up for haulage in the Netherlands; the more traditional NS class 1700 which were built from 1990 and based upon the French BB7200, and the modern Bombadier class 186 'Traxx' locos introduced in the last few years following the debacle of the failed 'Fyra' high speed service. 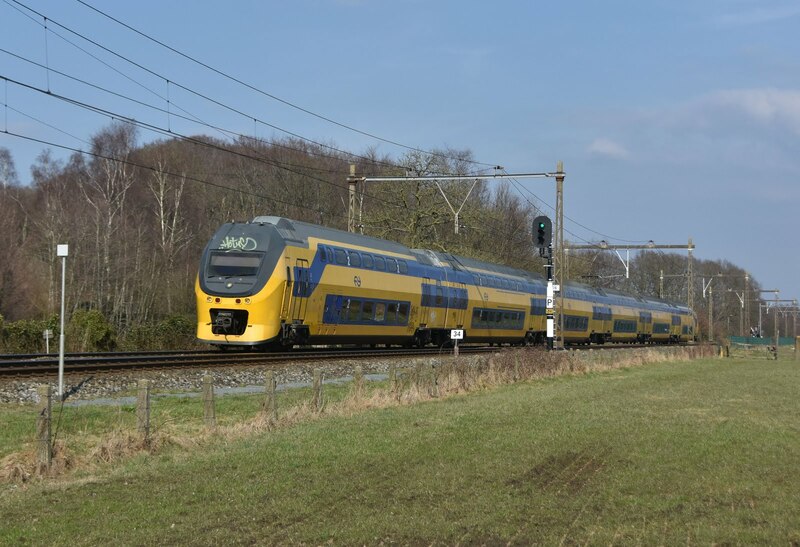 We wanted to sample both but this would involve some travelling as the only location where both services cross over is Amsterdam. 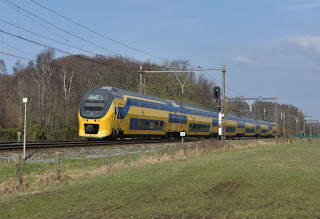 From Breda we took another Intercity on to Eindhoven (these trains while not branded 'Intercity Direct use the same coaching stock top and tailed by Traxx locos). It was then time to hop on an EMU again to reach the capital Utrecht where we would meet up with the 1700 hauled operation. NS 1700 locos are now undoubtedly in decline and their only 'traditional' hauled workings are the IC Berlin trains between Amsterdam and Bad Bentheim (where DB traction takes over). A handful do however still operate on push-pull 'Sprinter' services together with DD-AR train sets. we thought possible by the diagrams! 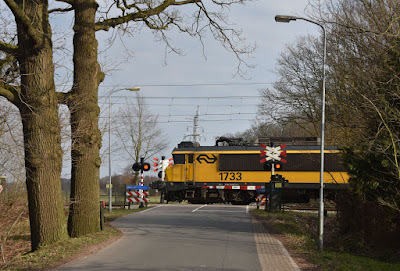 One such train approaches Nijkerk. 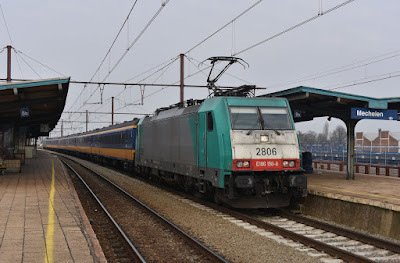 All DD-AR push-pull sets were withdrawn in the early 2010's with most coaches being refurbished and marshaled with EMU power cars to become true EMU's. However with the failure of Fyra and the ensuing traction shortage NS decided in 2013 to reactivate the stored DD-AR's which had not been overhauled and this meant bringing back the 1700 and DD-AR formation. Today these trains work local services between Utrecth and Zwolle and between Appeldorn and Almelo. There are aslo a number of DD1 workings on peak hours only between Amsterdam and Enkuizen/Haarlem. 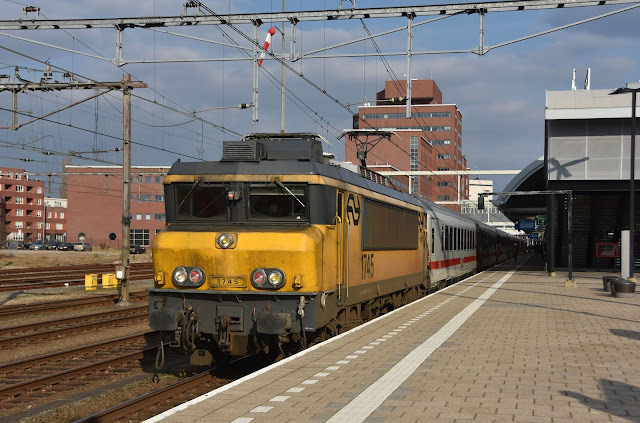 Our first target would be the Utrecht workings and would start with disappointment with the first diagram producing a DDZ (the post refurbishment motorised DD-AR). As the sun was starting to come out we took it anyway to search for a location to take some photographs and hoped to see some other push pull sets as we passed. 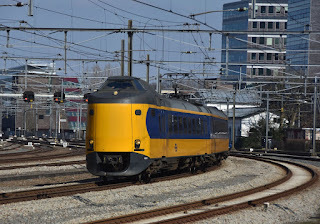 1736 pushes a DD-AR set towards Utrecht at Nijkerk with the local 'Sprinter' service. 24/03/2018. 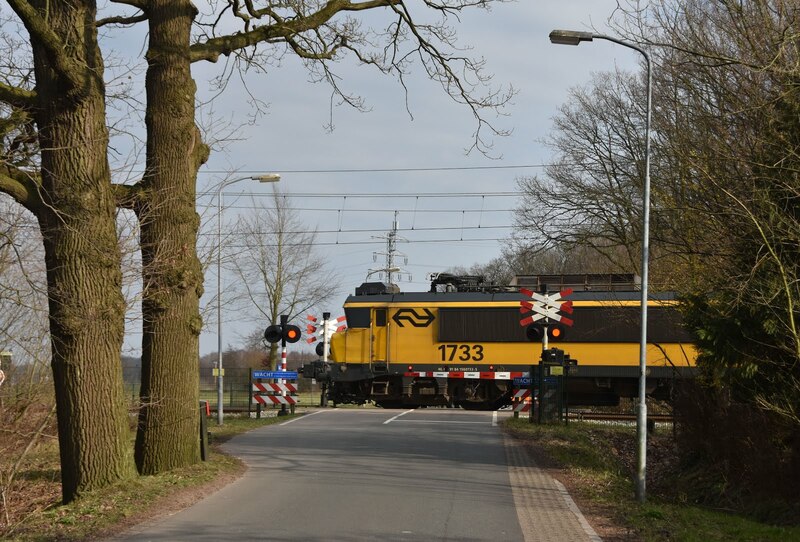 The line up of old locos at Amersfoort proved too tempting and we took a quick and worthwhile pause here. Many withdrawn locos are kept in the yard and former ACTS 6703 and 1251 were also next to the station (these bringing back memories of my first trip to the Netherlands, and indeed probably my first 'rail holiday' back in 2007 for Mercier Charters 'That Which Survives' which used these two locos in conjunction with 5814, class 58038 to you and I which was at the time working in the country with ACTS). 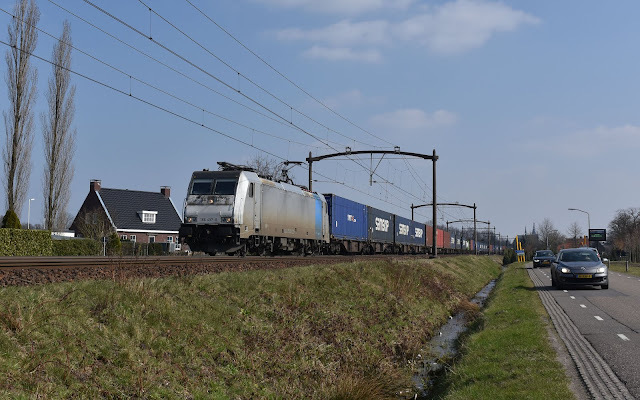 A ballast train was also photographed at Amersfoort before our journey continued, this time with a 1700 and DD-AR up to Nijkerk where we had found some views with potential for some good photos. It took a while to get the pictures we wanted as these trains are far from predictable. Despite the 'Sprinter' running every 30 minutes many of the trains had DDZ's on them, and many of those with a loco had it at the wrong end. 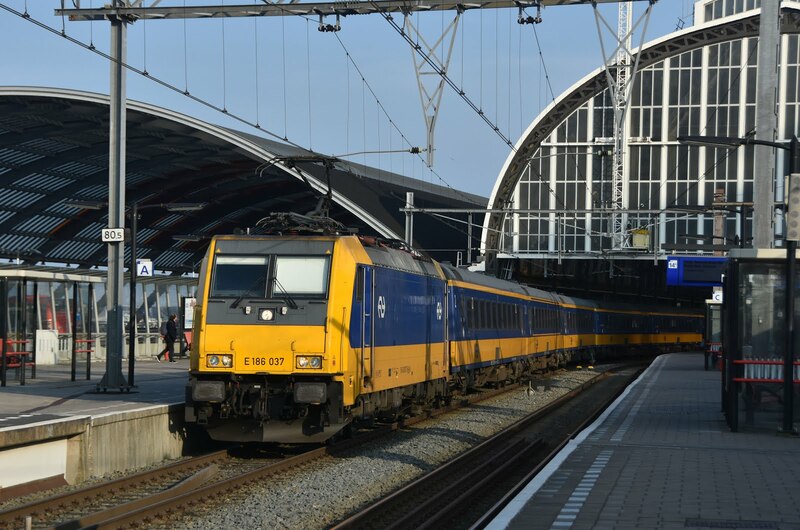 Eventually we got what we wanted and it was time for a quick dash back to the station to pick up another 1700 back to Amersfoort. 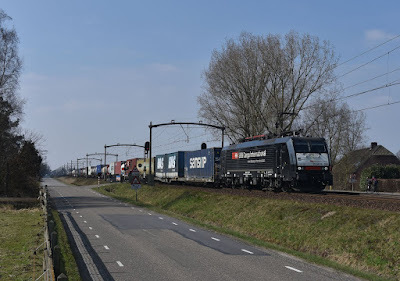 We had a fairly quick connection here to make the 2 hourly international train back to Amsterdam which arrived on time with 1745 at the front. This train would get us back to Amsterdam in daylight for some photos and also to explore the city which was a new destination to myself and my companion for the weekend Rhys. On board the IC Berlin train we sat near a couple of Dutch railway enthusiasts (they seem to be everywhere) who took great pleasure in telling us their favorite locomotives and a bit about the NS system. Certainly nice to see some enthusiasm from this young pair and all the others we bumped into. There was time for a few photos at Amsterdam Centraal, which is a beautiful (and giant) station, if a little difficult for photography. It was a slight surprise to be watching an IC Direct leave and watch Ian Ross and Daniel Brereton go past from the window- amazing who you can almost bump into on these trips! A few bars and a rack of ribs finished off the night in Amsterdam (which is beautiful for those not already well aware) before heading back to our airport hotel at Hoofddorp near to Schipol Airport- city centre hotels were simply too expensive for a rail trip! 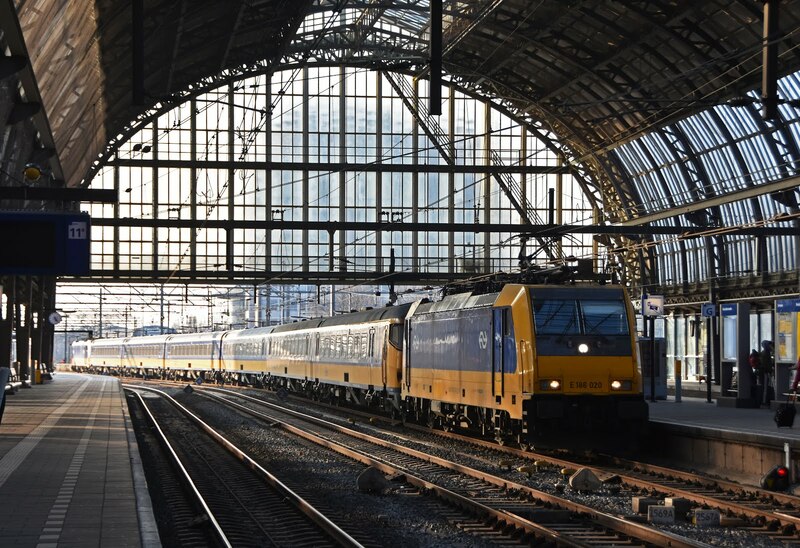 1761 passes light engine through the impressive station at Amsterdam Centraal on the evening of 24th March 2018. 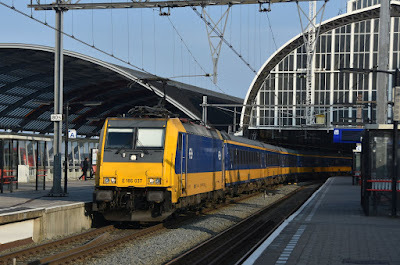 Challenging photography under the dark station canopy as 186020 arrives into Amsterdam with another Intercity Direct. My head was a little sore waking up in the morning, and the alarm perhaps wasn't as early as it should have been but the weather outside was lousy (and this was supposed to be the better of the two days). After a nice Holiday Inn breakfast we dragged ourselves back to the InterCity Direct network by way of Schipol and on to one of the many frequent trains via the High Speed line to Rotterdam. We had a couple of locations in mind for the day, the first of which was near to Delft Zuid. Boarding a Den Haag train from Rotterdam we once again bumped into Ian and Daniel (and were able to talk this time! 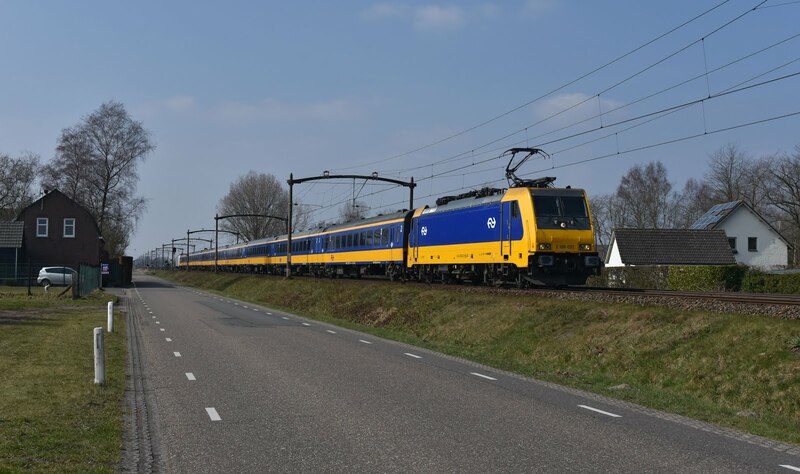 ), they provided the information that the sun was out in Breda, so rather than wandering around Delft we jumped on the next Eindhoven train back to make our way to the other spot at Boxtel, close to Tilburg. 186017 leads towards Tilburg with it's train for Den Haag. 25/03/2018. Sun was a little side on here, but at least it was shining! 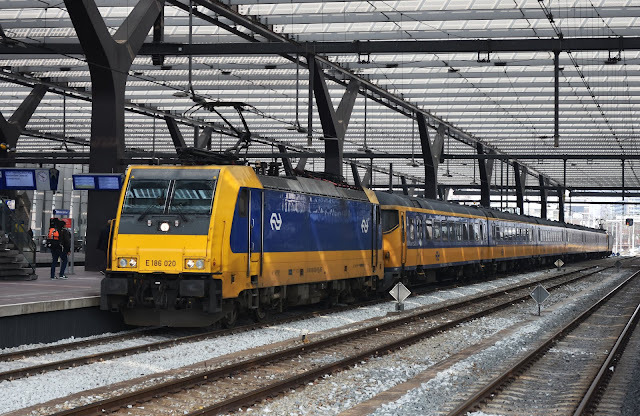 We didn't have a lot of time before we had to start thinking about heading back to the UK, but by taking our 'reserve' Benelux train rather than the one we really should have been on brought is about 90 minutes at this spot. 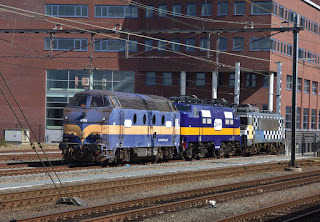 Time for a couple of the InterCity Direct trains and a few freights all of which passed in pleasing light. There was a slight mishap when two trains approached at the same time from opposite directions resulting in myself falling off a fence and some rather hurried shots- Ouch! I think they just about came out ok though! 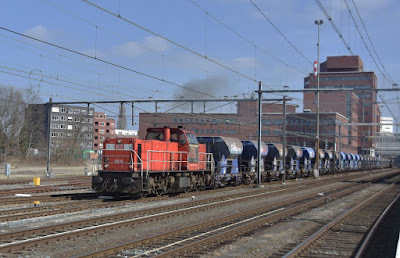 with an intermodal service heading south. 25/03/2018. Boxtel itself is served by local 'Sprinter' services in the hands of Talent EMU's (which I think are pretty nice as modern EMU's go), these got us to Tilburg to finally drop onto one of the might 'Koploper' Intercity trains to Breda from where it was back onto InterCity Direct to Rotterdam. 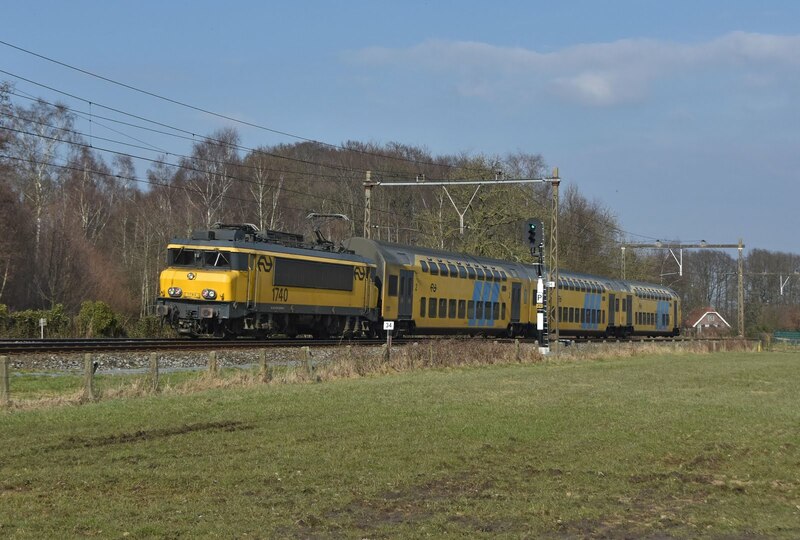 We could have saved considerable time sticking with the Koploper through to Roosendaal, however these had been terminating at Breda earlier in the day so the plan didn't work- though they did now appear to be running through. 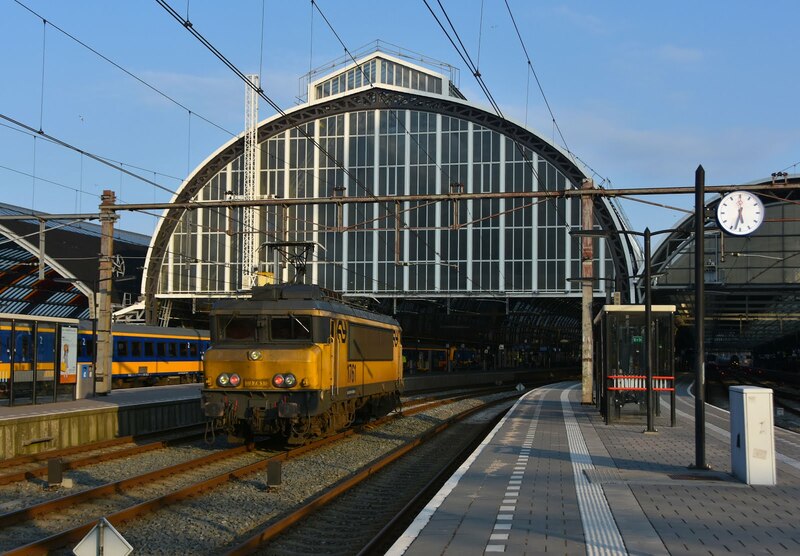 It was a healthy plus for our 16:09 Benelux train from Rotterdam but I still nearly missed it by going out to photograph the station. I was wondering if I had time to get a drink when I noticed it was 16:07 and I was outside the station barriers! Fortunately the train was made still with time for a photo, but it was a little closer than I would have liked. We had been travelling on FIP coupons within the Netherlands (the barcode for the automatic gates working with no issues) but I needed to buy my ticket on from Roosendaal to Brussels which I was hoping to do on the train. This wasn't a problem... except that the conductor would not (or couldn't) sell me a ticket with my FIP discount. I know I shouldn't really grumble too much but that's the first full price ticket in Europe I've had to buy for quite some time! 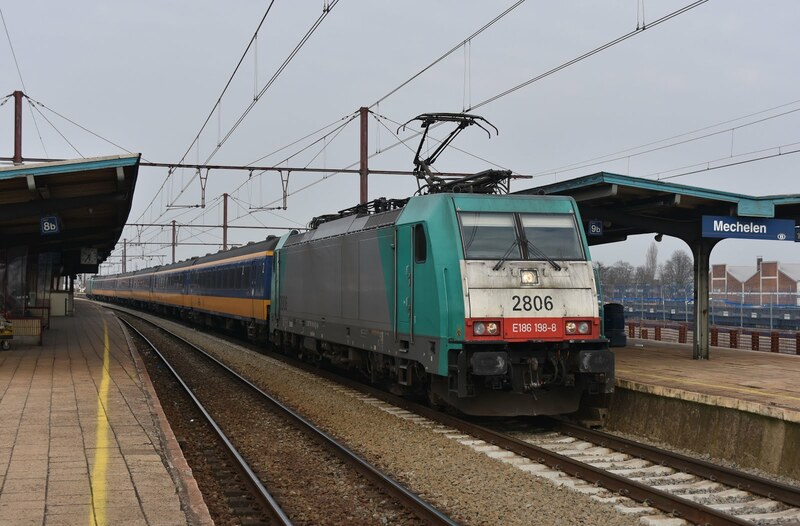 Instead of going right through to Brusselles we left the Benelux at the beautifully decrepit Mechelen to pick up another loco into the capital. Clearly this is a much easier move on a weekend than it is on a Sunday! 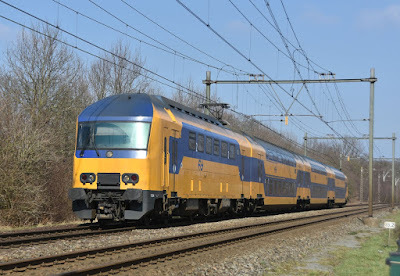 Eventually we gave up waiting a loco and settled for the refurbisehd AM75 EMU which was on an Antwerp IC service!!! I didn't know these EMU's were being refurbished and while the ancient interior will be missed it was nice to see it at least looking clean. 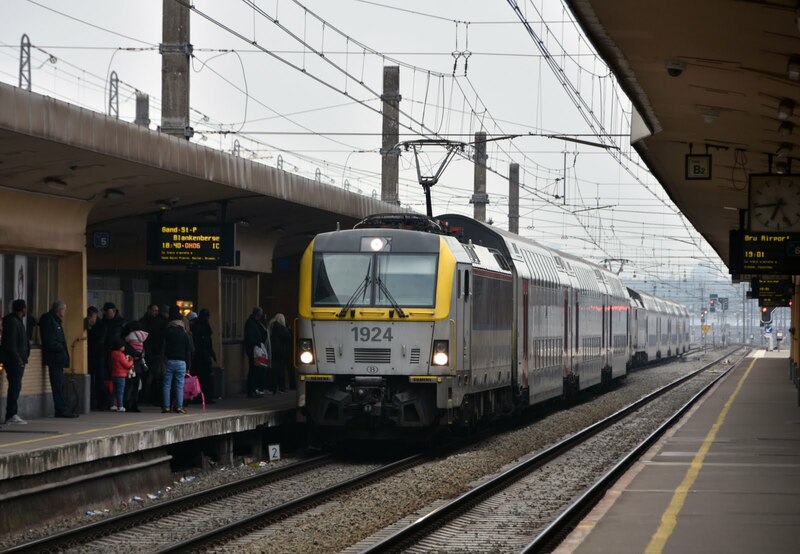 Once again we left the train at Brussels Nord hoping to pick up a loco to Zuid- again this proved more difficult that we thought, but eventually 1924 and 1914 arrived on a service to Blankenberge. There wasn't much time left to get food (obviously avoiding 'Quick' burger) but I managed a waffle which was eaten in the Eurostar queue before boarding the 19:52 which I still believe is far too early for the last train to London. 374019/20 obliged for the non-eventful journey back to St Pancras where it was nice to see a line up of all three types of train currently in use on Eurostar services with both original and refurbished class 373's lining up with the 374. All in all not bad for an easy weekend away with a few decent photos and another 19 foreign locos in the book. Another Intermodal at Boxtel with Railpool 186 457 (Leased by Captrain) at the helm heading north. 25/03/2018.